The portrait is likely of a day laborer that worked on the grounds of the asylum where the troubled artist stayed near the end of his life. After Vincent Van Gogh sliced off most of his ear in 1888, his friends and family convinced him to check into a mental institution at Saint-Rémy-de Provence. Luckily for art history, they still let him paint during his stay (though he wasn’t allowed studio time when he was experiencing an attack). 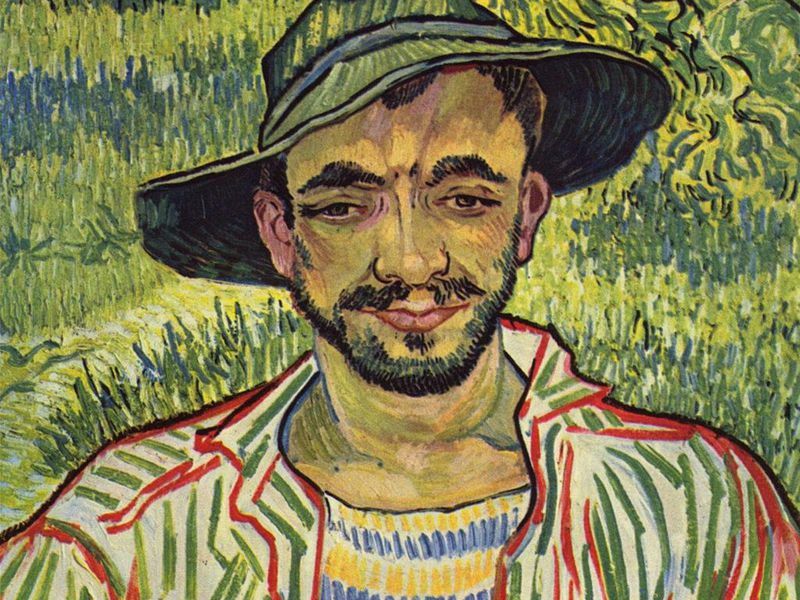 Indeed, in the little over a year Van Gogh was at the asylum, he produced a prolific body of work, including the portrait of a smiling man in brightly colored clothes simply known as “The Gardener.” Now, Martin Bailey, columnist at the Art Newspaper and author of the new book Starry Night: Van Gogh at the Asylum, has finally identified the mystery portrait sitter. Bailey reports for Art Newspaper that he found the name of the subject in unpublished notes held by the Musée Estrine in Saint-Rémy-de-Provence. The records include statements from Louis Poulet, whose grandfather François Poulet was an orderly and carriage driver at the asylum when Van Gogh was a patient there. According to those documents, the subject was a 28-year-old man named Jean Barral. Bailey tracked down what he could on Barral, finding that he was a farmer and day laborer in the area, which made it possible that he worked on the asylum grounds. Francois Poulet, an attendant at the asylum was known to accompany van Gogh on trips outside to paint, where it was possible the troubled artist could have interacted with “gardeners” or groundskeepers. Barbara Tomassi, a curator at the Galleria Nazionale d’Arte Moderna e Contemporanea in Rome, where the painting is currently held, calls the idea “plausible and susceptible to further research” in an interview with Bailey. Van Gogh himself was not a model patient. He had three major breakdowns there and tried to poison himself by eating his toxic paints and drinking the paraffin used in the lamps. In May 1890 he checked himself out of the asylum, saying that the “prison was crushing” him. Though a recent breakdown made it clear he was still not well, the asylum declared him cured. He traveled to northern France to paint spring landscapes, and two months later died of a self-inflicted gunshot wound to the stomach. As for Barral, Van Gogh captured the likeness of the friendly looking subject just before he suffered a devastating loss; the day before Van Gogh left the asylum, Bailey writes Barral’s five-day-old daughter, Adeline, died.